Description Create stratigraphically flattened (iso-proportional) domains based on horizons and times. The Flattener process creates an iso-proportional representation of the data based on specified horizons and times. Use the domain selector in the navigation bar to choose the resulting flattened domain. 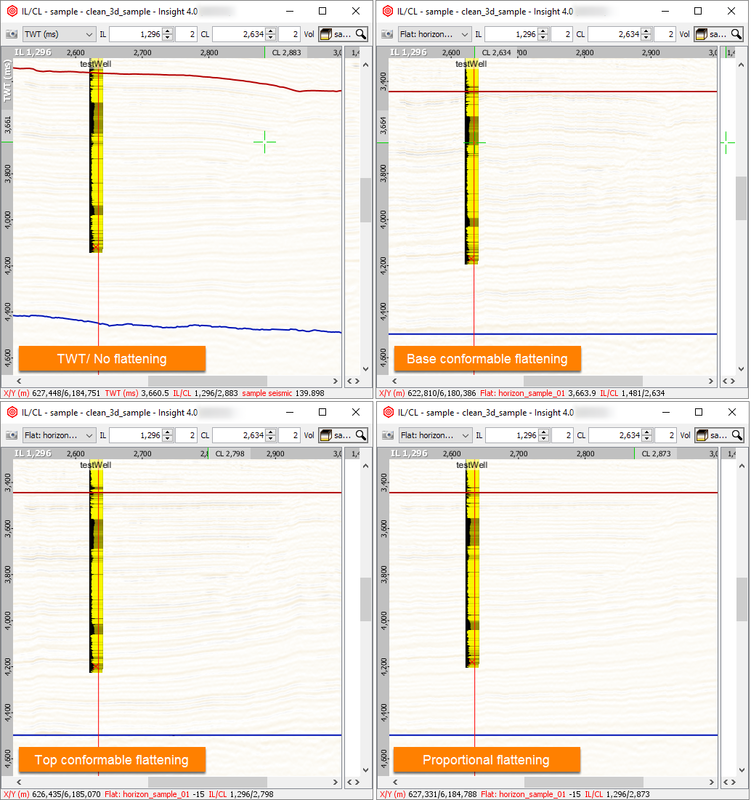 The flattened domain is supported in most views: cross-sections in IL/CL, arbline, 2D, as iso-proportional slices in the Map View, or as sections and slices in the 3D View. A session can contain many flattener processes, and each flattener creates its own flattened space. You can add, remove and rename them in the Process tab. Flatten on a single horizon. Flatten specific or multiple horizons. Right click on a horizon in any view and select Flatten on "<your horizon name>". A flattener process is created using the horizon. The view will switch to the flattened domain. The flattener process is located in the Process tab, in a folder named "Flatteners". 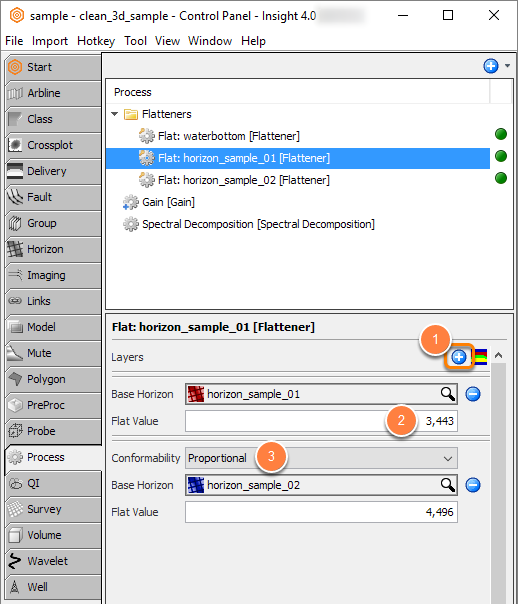 Create and configure a flattener process (see Processes Overview). Select the flattened domain to convert and view your data on-the-fly. Tip: When viewing a flattened domain in the map view, operations are performed in flattened space. 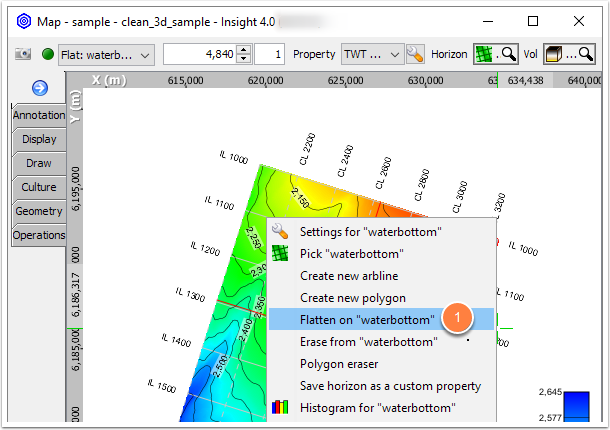 You can use this approach to more easily extract and analyse data relative to horizons (i.e. in iso-proportional space). In the Details Panel, at Layers, click the Add Row icon to add a layer of horizon that you want to flatten. Repeat this step if you want to flatten more than one horizon. The Flat Value refers to the TWT or TVDSS at which the flattened horizon will be placed. Note: Traces above the top layer horizon are always base conformable and traces below the last layer of horizon are always top conformable. Alternatively, click the Generate Default Structure icon beside the Add Row icon to automatically create layers using only visible horizons in your session. They will be listed in stratigraphic order. 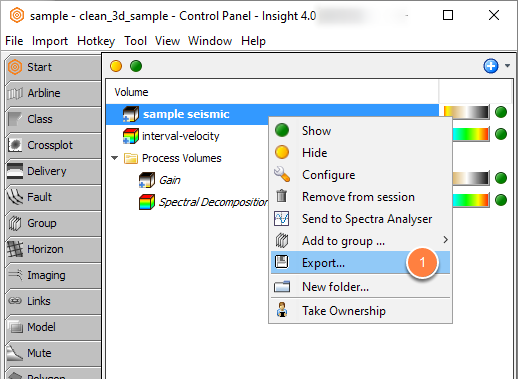 To export a volume in the flattened domain, right click on the volume in the Volume tab and select Export. Under Vertical Extents, click the pencil icon to edit the vertical extents. 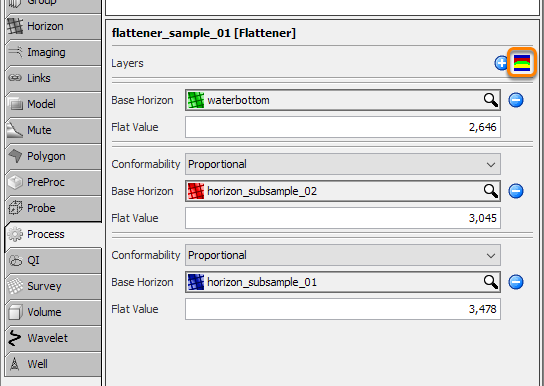 In the domain drop-down box, select the created Flattener process. 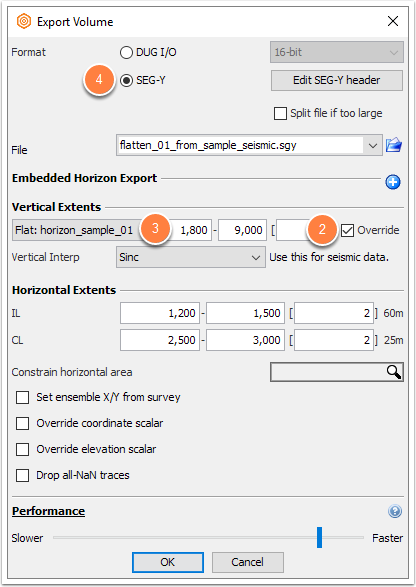 Flattened volumes are only exported as SEG-Y. Continue with the export (see Exporting to SEG-Y).